If you know me, you might not be surprised that I had to respond to the prompt of “5 Things I’ve learned” a little differently. The tradition, path, and experience of yoga is vast, and I still feel as though I have only tasted a slice of it. My reflections of this past inaugural year of M3Yoga are no different. I’ve only tasted a slice of what the community M3Yoga represents. And so what follows are instead, five things that have resonated with me this past year that I feel that I’m continuing to learn and explore. I’m learning how beautiful it is watch people’s practices mature and deepen. One of the utmost privileges I have is simply being a witness to how people’s practices have evolved over this past year. While physical endurance, strength, and flexibility often come with continued practice, I am more so in awe of how people’s strength, flexibility, and endurance of their ability to be present has evolved. I’ve watched you become even more present to how your body, your breath, and your emotions respond to the practice and experience yoga. It’s so moving. I watch you during class, and in my mind, I silently cheer you on — “YES! Be there!” Playing the small part of facilitating that experience for you has been magical and something that I continue to look forward to being a part of each and every class we share together. I’m learning how to deepen my own practice of yoga on and off my mat. I’ve been on this path for over a decade, but the space that represents M3Yoga has been a unique, welcoming embrace to growing in my personal practice. The community, or sangha, of M3Yoga that has formed over the past year has challenged me to continue to dig deeper into my own experiences on the mat and how they relate to the bigger reality of my life off of my yoga mat. The sense that “I’m not alone” in this kind of practice brings a derivative of courage that is unique to being a part of something bigger than myself. I’m learning that the more present I am for others, the more possibility we have to share in the divine connection we all share. You may be thinking, “Well, duh, Kate!”, but the practice of being present is always a challenge for me. I often find myself pulled into many spheres, but I never regret the discipline of being present when I walk into the M3 studio. The conversations I have with students before and after class continue to unveil the mystery of how yoga impacts and changes each and every one of us in different ways. I am thankful for everyone who shows up to be present to the practice, to themselves, and to those practicing next to them. I’m learning how to explore my own vulnerabilities as a teacher. Nick and Matt have been solid supporters of me, both as a teacher but also just as a human being, and I am forever thankful for their friendship. I’ve never been a part of a studio whose owners dedicated so much time and care to supporting their staff. The feeling of ‘feeling valued’ as a teacher from Nick, Matt, and the students of M3Yoga was somewhat new to me and continues to be something that surprises me often. Part of my own work this past year has been trying to swallow and embody that sense of feeling valued. I’m learning how to continue to be hopeful for the future of therapeutic yoga. I’m a firm believer that not all yoga is therapeutic, but I do believe that there exists a variety of practices that can be therapeutic for different individuals. To see the community of Athens openly embrace classes that traditionally lend themselves to being more therapeutic, meditative, and restorative in nature (e.g., Restorative, Pranayama & Meditation, Back Health, etc.) has been encouraging beyond measure to me. 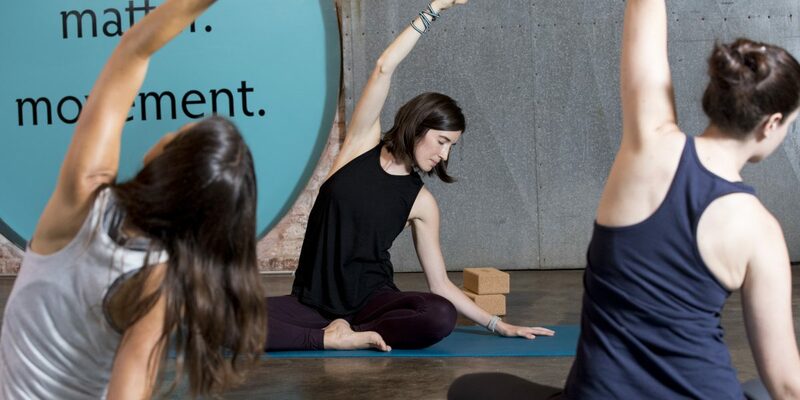 To those of you who regularly attend these classes, thank you for committing to a much more challenging practice of moving slowly and tuning into the more subtle, but just as powerful, experiences of yoga. Read more about Kate in her instructor profile.